The blurb sounds very interesting. Tell us about the book. 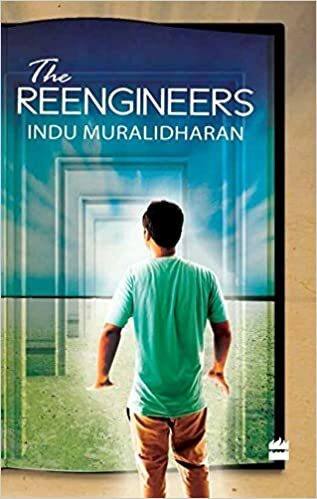 ‘The Reengineers’ narrates the happenings of one day in the life of fifteen year old Chinmay who lives in Chennai when it was Madras, in 1991. Chinmay is all set to kill himself to escape his dysfunctional family, when a surreal encounter transforms him from a timid, suicidal teenager to a confident young man, who knows that he is in charge of his destiny. It is a novel that can be read at different levels, as a coming of age adventure, an inspirational tale of self-empowerment or a meta-fictional exploration of the meaning of self and reality. 2. Tell us about your journey of writing the book. When I started writing seriously, I found myself gravitating to the path of writers who have explored and stretched the boundaries between fiction and reality. I rejoiced every time I reread Muriel Spark’s novels about literary protagonists whose narrative interweaves between fiction and reality in the world of the novel while being cognizant at the same time of the reality of the reader’s world outside it. This was my primary inspiration. The Reengineers grew from a few stories that I wrote about a character Siddharth who was forced to live in Conchpore – a place that he hated, and his relationship with his dysfunctional family. I thought about developing this into a full-length collection. But I found that I hardly knew anything about Siddharth, except that he was very unhappy and wanted nothing more than to get away from Conchpore and his family. Sometime later, I began to write a story about three teenagers from Madras in the early nineties who were displaced into another time and space in a fictional world. I wrote many drafts of the story of these three youngsters. Somewhere along the way, they met Siddharth and the metafictional premise took over the novel that became The Reengineers. 3. How did you go about publishing the book? Getting the novel published was a learning experience. I was fortunate to work with a wonderful editor at HarperCollins who helped revise my manuscript into a polished novel, while retaining both substance and soul of my original text. I learnt to become wary of copyediting, though. I had to rework the entire manuscript to clean up changes done by copy editors who took unspeakable liberties with the text, each time. We live and we learn. But overall, from the few primary edits to having a fabulous cover designed, the publishing journey was a great experience. 4. Tell us about Indu Muralidharan as a person and an author. To answer, let me share a version of my autobiography and biography that I wrote recently for a class exercise. Biography: Indu Muralidharan was raised in the suburbs of Madras, in a house with a large library. Her mother read Shakespeare to her at bedtime and taught her to recite soliloquies from the bard’s works before she was seven. She grew up in a multicultural and multilingual environment imbibing the voices of classic English authors and poets, and counts many of them among her early friends. Indu started writing when she was five. As she grew older, her obsessive love of fiction led her to read and write books that were about books, writers and the writing process. In 2015, HarperCollins published her first novel The Reengineers, a metafictional exploration of the meaning of the self, examined through the relationship between an author and the character of his novel. Indu lives in London, balancing a full time day job with writing and pursuing a part-time Master’s Course in Creative Writing from The University of Oxford. I am finishing the second draft of my second novel, which is an exploration of man-woman relationships through the twentieth century and till the present day. The story examines the dynamics of power and energy balance between the genders in a relationship. My third novel, still in the embryonic state is a light-hearted story of a young woman who runs a very unusual counselling service. I am also working on a narrative nonfiction project, a cross-genre of biography and travelogue, exploring paranormal experiences through esoteric art forms. 6. Tell the readers, why should they read this book? This book will interest a reader, if they have ever felt like a misfit within their peer group, if they have ever felt that their family does not understand them, if they have desperately had a crush on a schoolmate, if they have ever felt confused and helpless on wanting the security of childhood as well as the freedom of a grownup; in short it will interest anyone who has been, or is a teenager. The book will interest anyone who likes to read fiction that makes them think, with ideas that inspire, and empower. For it is a story of self-empowerment. The book will interest anyone who has been depressed in their lives. Chapter Five contains selections from a self-help book packed with advice on how to survive while depressed. (More than one reader has written to me that the book is worth buying just for Chapter Five alone). The book will interest anyone who enjoys reading metafiction. The plot turns the classic metafictional premise on its head. The book will interest anyone who likes reading young adult books, for it is a coming of age story at its core. And yes, the book will interest anyone who likes a small dash of nostalgia for the sweet and simple days of the early nineties, of life before internet and mobile phones. Thank you Indu for this fabulous interview. It was a delight to read. My pleasure, Lata! 🙂 I enjoyed reading your reviews on kaapitimes, especially love the site name!